The Monkeys: International Box Day! Samson and I are very excited about International Box Day put on by the wonderful people at Zoolatry! We're very happy to participate because, let's face it, boxes rule! I think most of these pictures speak for themselves so here are our best box shots! 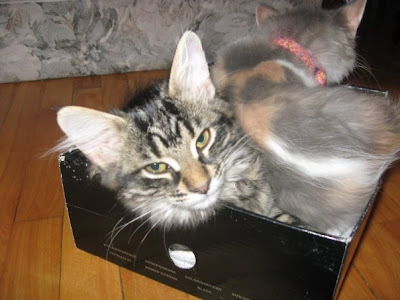 Our new friends, Mischa and Pasha, wanted to be involved too so they sent over some of their kitten in boxes pictures! 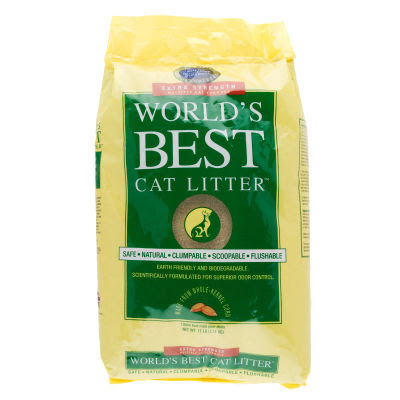 In keeping with the box theme, we also received a bag of The World's Best Cat Litter to try out in our litter 'box'. Mommy told us to eat lots of fiber so we can review it (????). She laughed when she said that but I don't know what fiber is... She thinks she's funny. Have a great Box Day! they are all FANTASTIC !! That first photo with the laser eyes is so cute!! You are all in boxes! I am afraid of boxes! Though my brother and sister like them sometimes! You two obviously have a thing for cardboard boxes. And it looks like Mischa and Pasha are going to be the same! You two have some wonderful box pictures. This is a day for you kitties for sure. Ohmygoodness!! You guys have the best cat in box pictures!! Love them! We love all of them! You have the best photos! 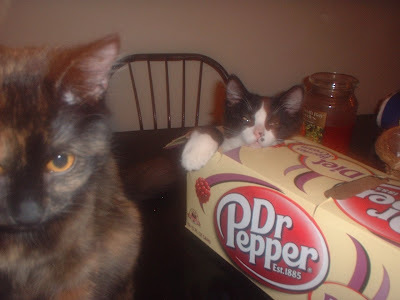 The one of Samson in the Dr. Pepper Box is really funny - particularly Deli's expression. We're glad to see Mischa and Pasha are learning how to enjoy boxes too. Yay! Whoa! You guys have LOTS of boxes to choose from! A very nice assortment. Those kitties Mischa and Pasha in shoe boxes are super kyoot! Those are realllly great Box Day pics!! Thanks fur sharing them! Those are great box pics! We love Mischa and Pasha's pics too! This is so much fun seeing all us kitties in boxes! 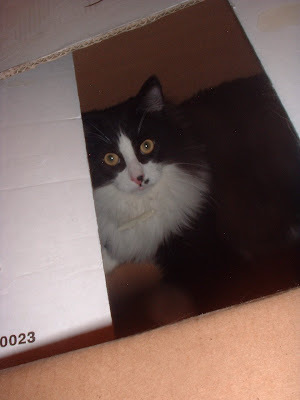 You found some really nice box pix. You two sure love your boxes! Cute photos! And Mischa and Pasha are cutie pies in their box too! Happy Box Day! Wonderful box photos, Samson and Delilah! You sure are good at showing off all the best uses fur those things! And you even have a guest box fur snuggling! You to have lots of box pictures! You must love them as much as we do! Both you and the kittens look great in your boxes. What good box pictures you have. Happy Boxday to you all! Loki loved your pictures. 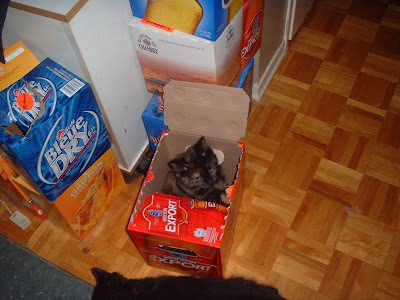 Nanny had no idea that cats loved boxes. Those are great box pictures - you guys really love the boxes a lot it seems! You two are some kinda box experts or something! Do you see a box arriving at your home perhaps on Monday, Samson? Happy International Box Day! Your pictures are great!! So many boxes, so little time! How do you choose!!!? Oh you two look so cute together. So many wonderfur box pictures! I luvs em all! Those are some super photos...I can see how you two got nicknamed the Monkeys! I bet you keep your mom entertained constantly. Those are all great box photos. We like the first one with you both peeping out together. You two sure know how to make the most of a box! 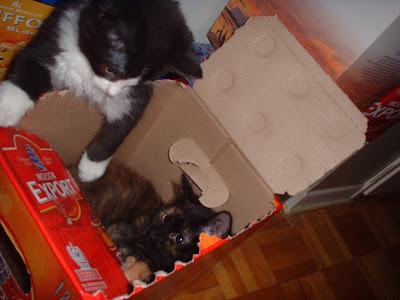 We like the soda can box pix the bestest! 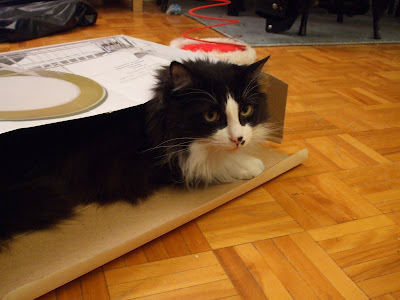 What a wholelotta great boxes you two have, and Samson, you really like to snuggle down into them don't you.